I like the location and the room is spacious although seems old but still in good condition. The wifi is ok but limited use per day. The staff is helpful. Location, comfort, facilities, check out time are all in good expectation range. The location is fantastic, close to Town Hall station and plenty of restaurants and cafes near by. A short walk to Hyde Park, Westfield and the Australian Museum. The staff were friendly and helpful. We booked early and paid extra for a 'city view' premier apartment and we got a bay window room on the 28th floor. The 1 bedroom apartment was spacious and comfortable. The apartment was clean. If we were staying for longer than 1 night it would have been very good. The rooms were very spacious and perfect for a group of ladies. This was my 50th and couldn't have picked better rooms. We stay @ this hotel 2-3 times a year and we are never disappointed. Close to facilities and great atmosphere at the hotel. 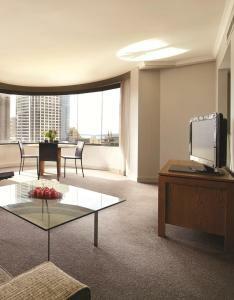 Lock in a great price for Adina Apartment Hotel Sydney Town Hall – rated 8.5 by recent guests! 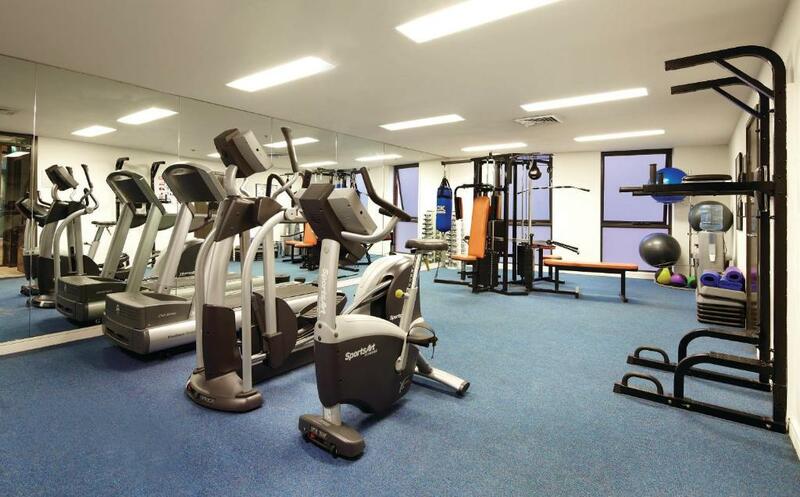 Adina Apartment Hotel Sydney Town Hall This rating is a reflection of how the property compares to the industry standard when it comes to price, facilities and services available. It's based on a self-evaluation by the property. Use this rating to help choose your stay! 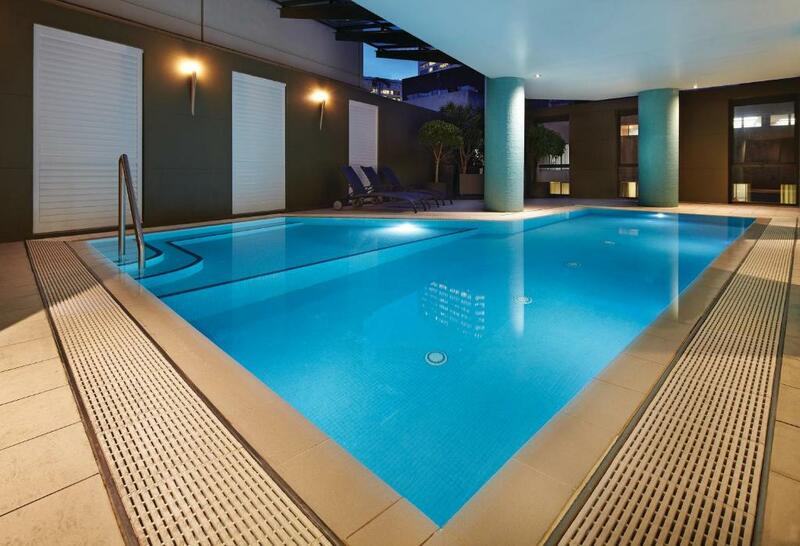 One of our top picks in Sydney.Featuring an indoor heated swimming pool, a fitness center and sauna facilities, Adina Apartment Hotel is located in Sydney CBD (Central Business District). It offers air-conditioned apartments and studios with a private balcony. Guests receive 100MB of free WiFi per 24 hours. 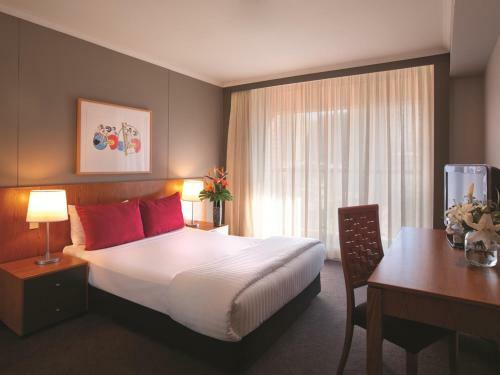 The spacious accommodations at Adina Apartment Hotel Sydney features modern décor, cable TV and kitchen or kitchenette facilities. All have large windows, and some offer stunning views of the city skyline. 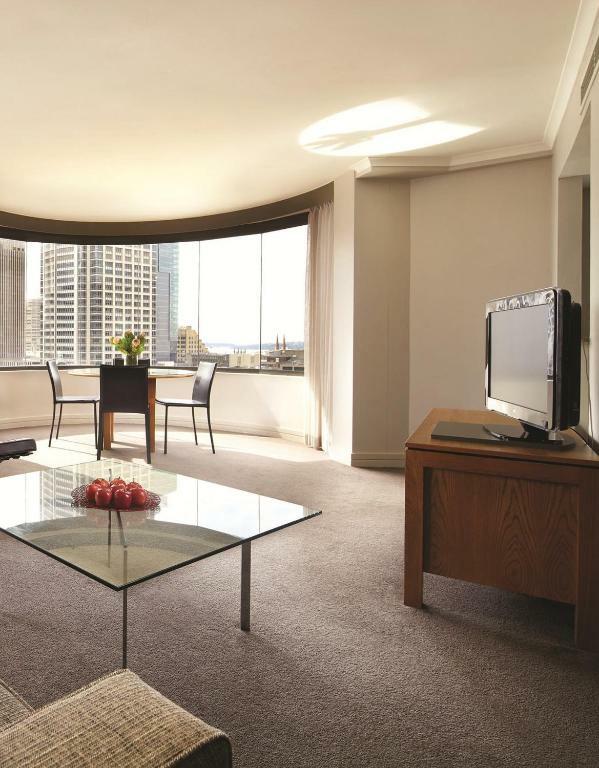 Sydney Adina Hotel is a 2-minute walk from Town Hall Railway Station, offering access to all of Sydney’s top attractions. Darling Harbor and Chinatown are both within a 5-minute walk. It is a 25-minute drive from Sydney International Airport. 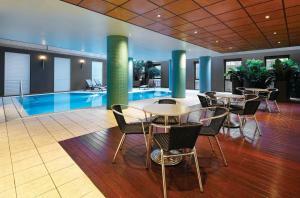 When would you like to stay at Adina Apartment Hotel Sydney Town Hall? Features a small kitchenette with microwave, toaster, teakettle, dishes and cutlery. Please note that twin beds are only available upon request. Please note there is no capacity for extra guests. Features a separate lounge and dining area, fully equipped kitchen and laundry facilities. To request your preferred bedding configuration, please use the special request box when booking or contact the property using the contact details found on the booking confirmation. Offers views of the city skyline from the spacious balcony. Offers stunning city skyline views, kitchen, laundry and lounge/dining area. Some rooms come with a bay window (upon request and subject to availability). 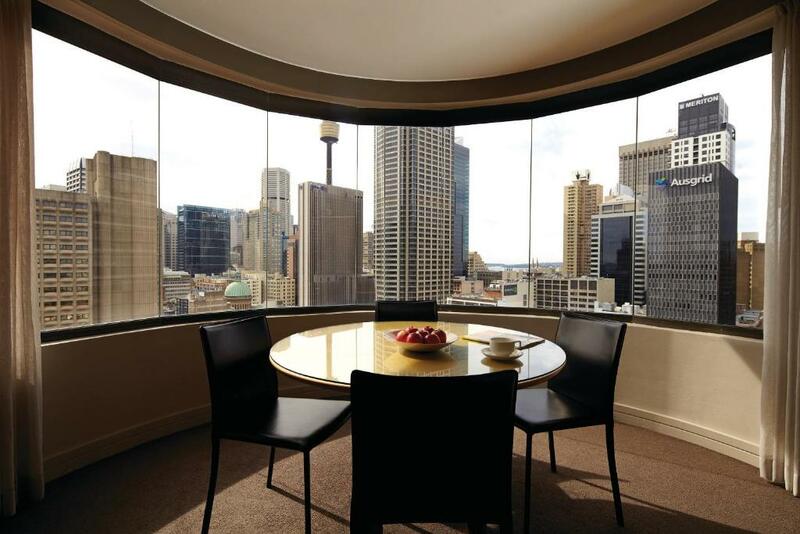 Offers stunning city skyline views, 2 bathrooms, kitchen, laundry and lounge/dining area. Some rooms come with a bay window (upon request and subject to availability). We are superbly located in the CBD, surrounded by cosmopolitan cafes, bistros & restaurants. 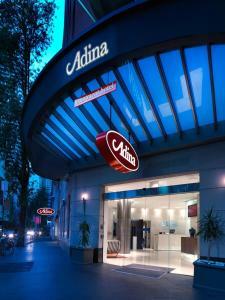 Whether you are travelling for business or leisure, Adina Apartment Hotel Sydney is your ideal base. Step out for a leisurely stroll through the specialty stores of the Queen Victoria Building or Pitt Street Mall, enjoy easy access to premier tourist spots such as Sydney Centrepoint Tower, Chinatown & Hyde Park, enjoy the nightlife at Darling Harbour, or take the train or bus to Circular Quay and The Rocks. House Rules Adina Apartment Hotel Sydney Town Hall takes special requests – add in the next step! A AUD50 damage deposit is required on arrival (around USD35.18). This deposit will be fully refunded 14 days after check-out, as long as there isn't any damage to the property. Debit card Adina Apartment Hotel Sydney Town Hall accepts these cards and reserves the right to temporarily hold an amount prior to arrival. 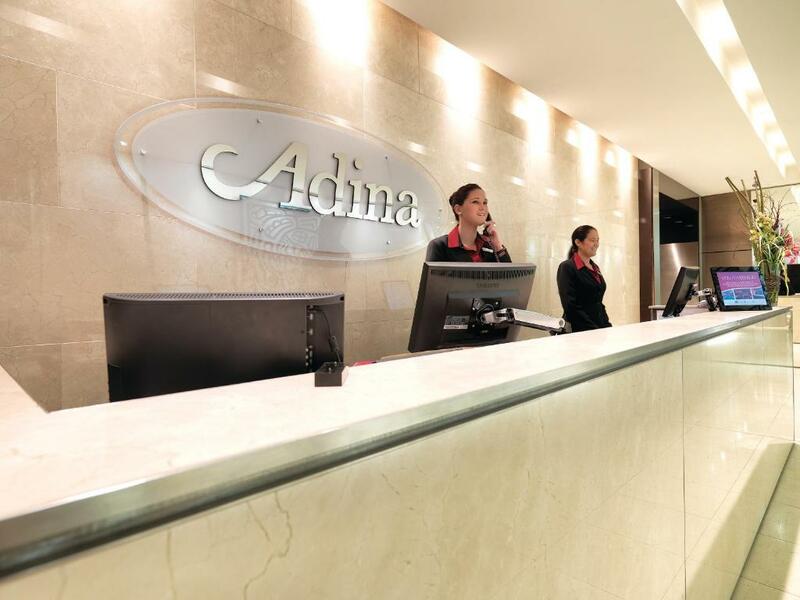 Adina Apartment Hotel Sydney Town Hall accepts these cards and reserves the right to temporarily hold an amount prior to arrival. Please note guests receive 100MB of free WiFi per room, per 24 hours. Additional data is available for AUD 9.95 for the remainder of the 24 hours, for up to 4 devices per room. Please note that all rooms, including balconies, are nonsmoking. Please note that there is a 1.2% charge when you pay with a Visa, Mastercard, American Express or China UnionPay credit card. Please note that there is a 2.5% charge when you pay with a Diners Club or JCB credit card. - Credit card pre-authorization of AUD 200 for Two-Bedroom Apartments and Three-Bedroom Apartments. A damage deposit of AUD 50 is required on arrival. That's about 35.18USD. This will be collected by credit card. You should be reimbursed within 14 days of check-out. Your deposit will be refunded in full by credit card, subject to an inspection of the property. We where on the top floor (29) and we could here the plumbing for the whole hotel all night as the large tank on roof filled. This would not be an issue on lower floors. The location, the room was exceptional and big. Plug in bathroom dirty, had to clean before could use. Position close where I wanted to go, close to transport. Ease of book in and out and helpfulness of reception and maintenance when had a problem with the TV.. Booked for 3 people, received towels only for 2, consumables not restocked (stayed for 6 nights) so continuously had to ask for toilet paper (! ), coffee and extra towels. 1 day apartment not serviced and 1 day only rubbish collected but no beds made etc. 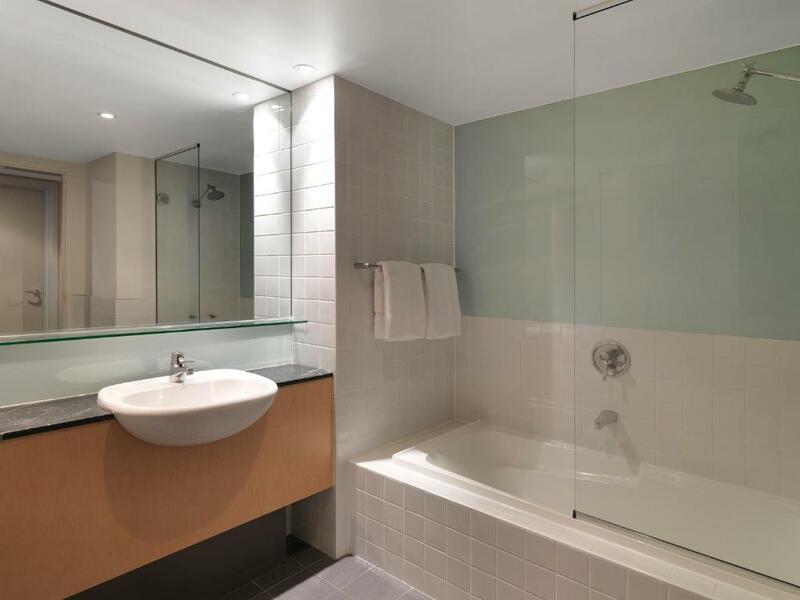 The rooms were looking a bit old and in need of some updating but generally ok.
Great location literally opposite Town Hall station and five mins walk to Darling Harbour. Our room was upgraded with no extra charge. View was not good unfortunately. All was good the only thing was we got the room that was looking out into the next building so only saw the wall unless went out on the balcony and stuck my head out. Impressed with size of apartment and the convenience to downtown Sydney including China Town and Darling Harbour.